For mums running a small online retail business, the Post Office is a daily part of life. 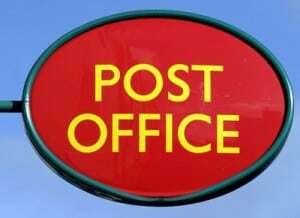 But Post Offices up and down the country are closing due to diminishing incomes. In theory, the year-on-year increase in online retail should help individual Post Offices, but Royal Mail have concurrently developed a number of online prepaid postage products that enable small businesses to weigh, pay for and print postage at home. Prepaid postage bypasses the revenue stream of your Post Office, but creates additional work as they are still obliged to handle the post when it is dropped off (although some Post Offices are limiting the number of prepaid postage parcels they will take per customer). While it is tempting to deal with your postage in the comfort of your own home, this could contribute to the closure of your local Post Office, with negative effects on the community. Much better to work with them and both benefit from the partnership. Weighing your parcels at home and writing the weight on each parcel/on a Post-It note will save time on the weighing scales. Writing on the service you require (First/Second/Special delivery etc) will also speed up the transaction. Taking your parcels in to the Post Office at a certain time each day when you know them to be quiet will save you time in the queue. If you develop a good relationship with your Post Office, they may be prepared to let you drop off your parcels, and then they will weigh and process them in your absence, taking payment from you later in the day/the next day. Ask your Post Office to give you a ‘Certificate of Posting’ book. Your Post Office will probably be happy to stamp these retrospectively (with the actual date of posting) in the event you need one to make a claim for damage/non-delivery. If the majority of your parcels fall into one or two price bands, consider purchasing ‘make up value’ stamps from your Post Office up front and then affixing the stamps at home. It means you can just drop off your parcels at the Post Office without having to queue. Another benefit from using ‘make up value’ stamps is that your parcels are treated as First Class, as the people handling the packages through the postal system can’t tell if your parcel is First or Second class, so default to First.